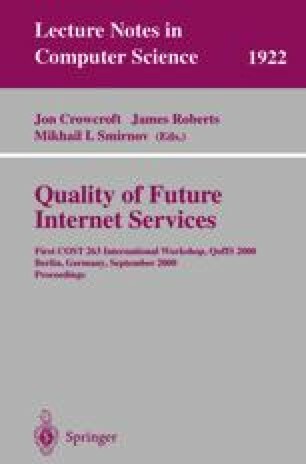 Per-hop behaviours capable of supporting different traffic classes are essential for the provision of quality of service (QoS) on the Internet according to the Differentiated Services model. This paper presents an approach for supporting different traffic classes in IP networks, proposing a new per-hop behaviour called D3 - Dynamic Degradation Distribution. The approach allows for the dynamic distribution of network resources among classes, based on the measured quality of service and on the sensitivity of classes to performance degradation, without implying any substantial change to current IP technologies. A router prototype developed according to the proposed approach is presented, along with the results of experimental tests that were performed. The test results demonstrate the feasibility and the effectiveness of the underlying ideas. S. Floyd et al., “Random Early Detection Gateways for Congestion Avoidance”, IEEE/ACM Transactions on Networking, August 1993. http://www.nrg.ee.lbl.gov/floyd/papers.html.